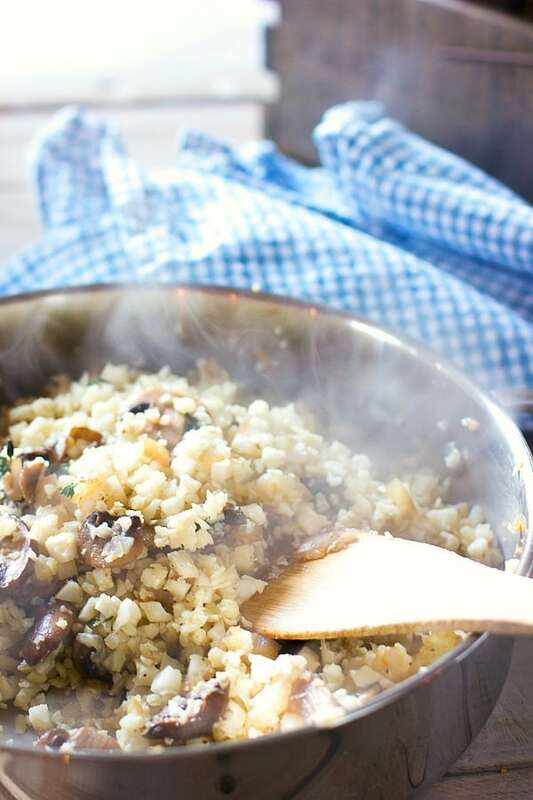 Cauliflower Rice with Mushrooms and Feta! – This combo will make you quickly forget it’s cauliflower and not rice! Cauliflower rice where have you been all my life! I mean I have heard of it, but I really didn’t think it would taste like rice…but it does! Especially with a little help from my beloved mushrooms and pinch of thyme and feta! A huge tasty helping of this stuff clocks in at only 99 calories a serving, and it’s a big serving! I bought a two pound bag of it at Costco. I used fresh, but frozen will work fine. Just increase the cooking time by a few minutes. 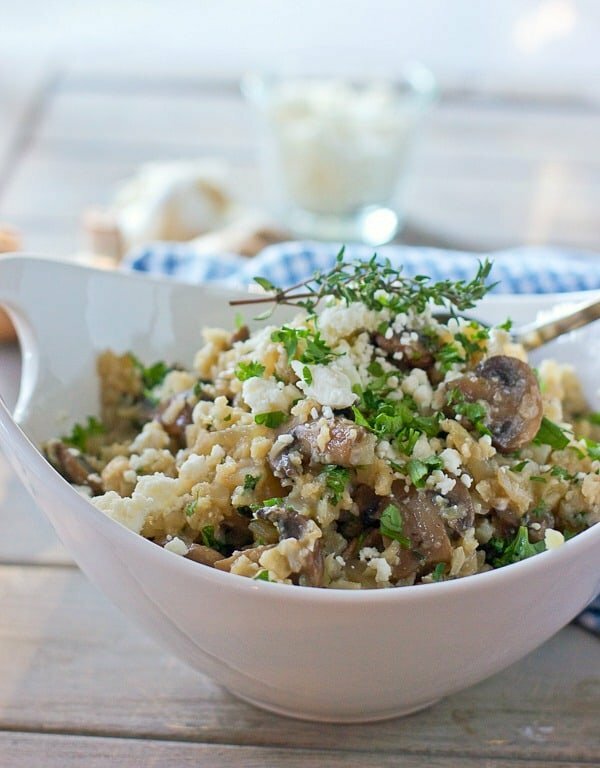 The mushrooms and the thyme give it an earthy flavor and the feta? Well everyone knows feta makes everything beta! Easy of course…I mean super easy! Chop, chop, sauté, sauté, eat eat! First things first, the mushrooms, onions and garlic. TIP: Do not salt your mushrooms until they are as brown as you want them. Salt keeps them from reaching their full browning potential! Cauliflower rice comes several ways. Fresh or frozen works in this recipe. Buy a fresh whole cauliflower head and either grate on a box grater or pulverize in your food processor. Store bought fresh riced cauliflower. Store bought frozen riced cauliflower. After a quick sauté add your stock, a pinch of thyme then toss in a little feta. Need some better tips on how to make this? Watch this video! If you are Paleo, Whole30 or on any other eating program that restricts dairy, simply omit the feta. The flavor is still fabulous! Fresh or frozen (unthawed or thawed) works, just increase the cooking time a bit if working with frozen. Add more veggies! Carrots, broccoli, leeks are a few that come to mind. To healthy and flavorful food! 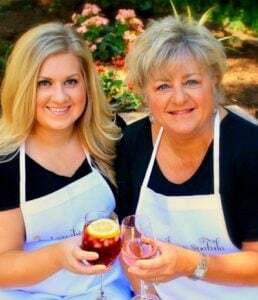 Check out a few of my other quick cooking healthy recipes here! 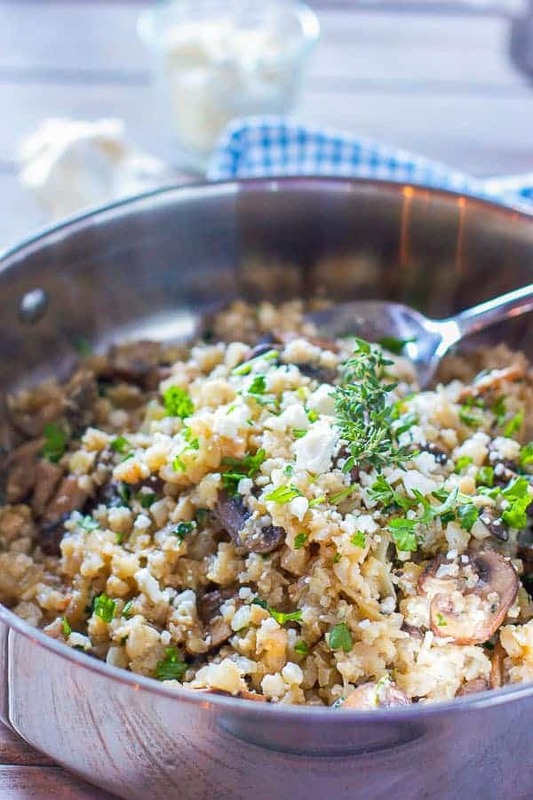 A quick, healthy and flavorful dish made with cauliflower rice, feta, mushrooms and thyme. In large skillet heat olive oil. 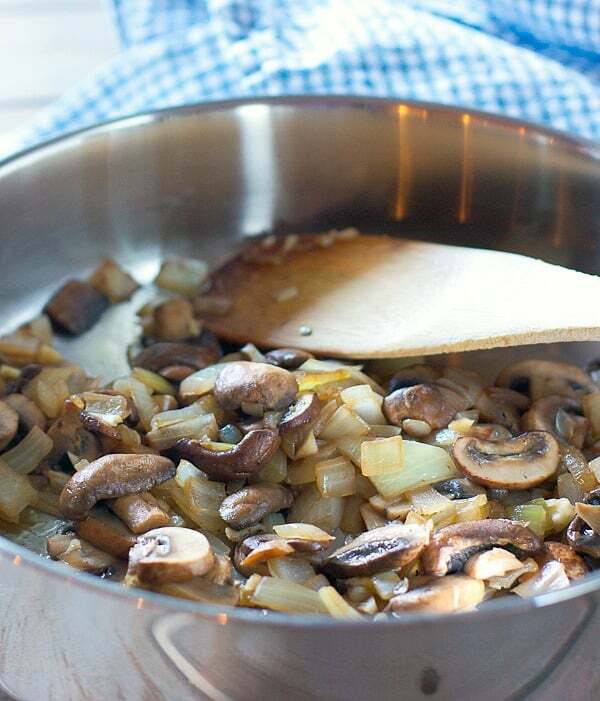 Add mushrooms and onion, sauté until onions are translucent. About 3-4 minutes. Add garlic, cauliflower rice, salt and pepper. Saute until cauliflower is slightly tender. About 5 minutes. Continue to cook until cauliflower rice is fully tender and most of the liquid has been absorbed. About 5 minutes. Add feta and taste. More salt? pepper? thyme?. Garnish with additional thyme and a bit more feta if desired. 2 WW Freestyle points for a heaping cup. Just made this recipe and LoVED IT! I just wonder if nutritional facts are accurate. The sugar and the carbs count look a little high. A little. Hi Alex! You got me wondering so I double checked and here is what I found – 4 cups of cauliflower rice equals 31 carbs. That is the bulk of the carbs in the recipe although you get a bit with the onion and mushrooms. So all in all it looks pretty accurate to me. Hope that helps and I am glad you Loved the recipe! this looks so good!!! However it is not Whole 30. 🙁 (it was in the Whole30 section FYI) when I am done with whole 30 I do plan on making this!!! 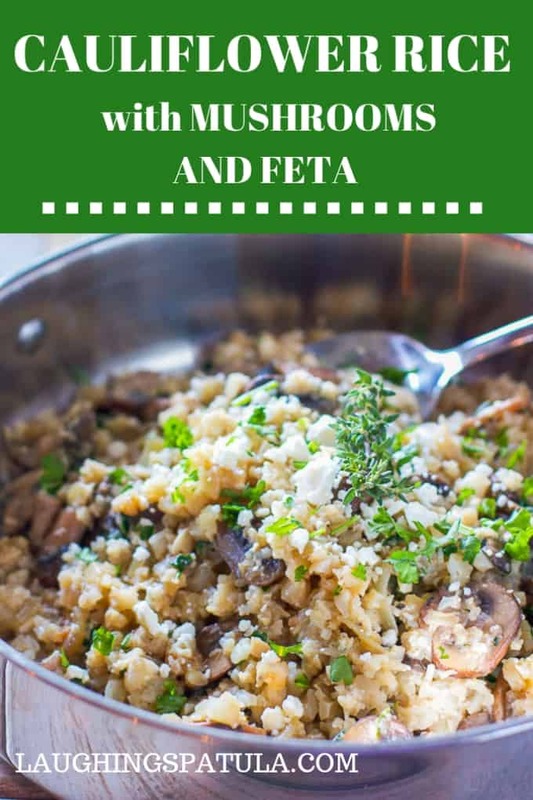 Hi Amanda – omit the feta and you are good to go! Pretty disappointing. I taste as I cook. I kept checking the recipe to see if I had left anything out. I even added a whole extra cups of mushrooms from the start as we love the ‘meaty’ taste. I added a ton extra of thyme, tossed in roasted garlic seasoning and butter. Used parmesan cheese in hopes it would punch up the taste. Not horrible but won’t make again. Hi Gloria- Sorry to hear you weren’t a fan. While cauli-rice does have a huge following, it can be an unfamiliar taste to those who don’t eat it often. Either way- Thanks for the note! I am making good this tonight. Do I need to ring the water out of the cauliflower after I put into the food processor? Hi Diane – no need to squeeze the water out of the cauliflower for this recipe. This was very yummy. Needed to use up a bunch of mushrooms and had the other ingredients. Glad I found this recipe. Thank you beth! It’s one of my faves! This looks delicious! 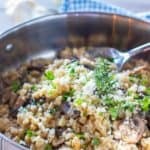 I haven’t tried cauliflower rice yet, it looks amazing! I am a HUGE fan of cauliflower rice and this looks amazing! I make a couscous with cauli and it is loved even by my husband!